The MetaNeb® System is a piece of medical equipment that helps clear sputum from a patients lungs. This is particularly important for a person with CF as it is the build up of sputum that results in infection, breathlessness and permanent loss of lung function. 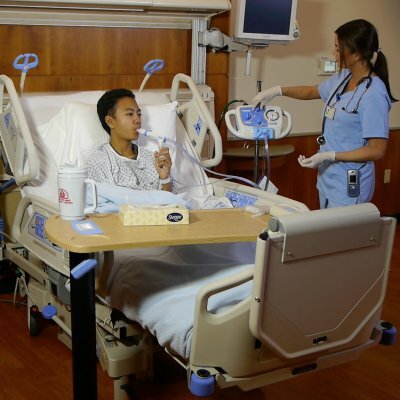 Kings College Hospital have been trialling the MetaNeb® System with their patients who are requiring hospital treatment for exacerbations of their CF. The trial has been a success and is now coming to an end and the team would like to have a Metaneb on the ward so that they can always offer this treatment as an option to our patients when they are in hospital. When a patient is admitted to hospital because of their CF, help with physiotherapy and airway clearance is one of the most important things a patient needs. The Metaneb works by delivering a nebuliser to the patients lungs, whilst at the same time delivering a combination of positive pressure as they breathe out to help splint the airways open and oscillations to help 'shake and shear' the sputum from the airway walls. By optimising a patients physio and airway clearance during an infection and clearing sputum in the most effective and efficient way possible, we can hopefully get a patient back to being fit and well as quickly as possible and reduce the chance of any permanent loss of lung function.